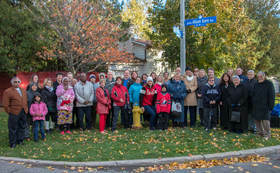 ​Alison Korn and Maude Menten have finally been recognized through our city’s commemoration process thanks to the Trailblazing Women Initiative I began in 2014 with the help of Councillor colleague Diane Deans. The city has a grassroots nomination process that relies on residents to nominate worthy individuals. While the system is fair, over 90% of people commemorated in street namings in our city up until now have been male. That is because, even though anyone can do it, the number of accomplished females being nominated is disproportionately low. But there are many women who deserve to have their accomplishments recognized. Councillor Deans and I assembled a number of community leaders to tell the public about the opportunity to nominate worthy women to help our geography better reflect our history. Men will still be commemorated, but we don’t want people to forget about women who helped shape the city and the country - women like Alison Korn and Maude Menten. In 1913, Ms. Menton became one of the first women to earn a medical doctorate. She helped contribute to the creation of the Michaelis-Menten equation in biochemistry, which helped shape the field of biochemistry . She was inducted into the Canadian Medical Hall of Fame in 1998. Nepean’s own Alison Korn won Olympic silver in rowing in Atlanta in 1996 and bronze in Sydney in 2000. Between 1995-2000, she was on the national rowing team, part of a strong women’s program that medalled consistently at many world cups, championships and other international events. After rowing, Alison used her experience as both an athlete and a journalist in her role with the Canadian Paralympic Committee where she promoted the Paralympic Movement in Canada. I am proud to say that we now have 12 more prospective women that we have vetted through local historians and other experts, and who are now on the list to be commemorated. For example, Kathy Ablett (iconic long serving local Catholic School Trustee who passed away very recently), Elsie Knott (the first Canadian woman to become Chief of a First Nation), Hilda Ranscombe (creator of Canada’s first famous women’s hockey team) and Patricia Pepper (who, among other things, produced results in violence against women as one of the founders of Nepean’s Nelson House) are on the list. If you have ideas about people who should be nominated, male or female, please contact my office.